I always knew I wanted a natural childbirth, so I began researching doctors in Las Vegas whose birth philosophies aligned with my own. I also wanted a female provider, but to my surprise, I could find none. Then I heard a radio commercial for Well-Rounded Momma—a place where I could learn more about natural childbirth. I stopped by one day after work and spoke with one of the midwives who explained that they specialized in home births. I was somewhat skeptical at first —I thought home births were for hippies, and I was under the impression that delivery had to take place in a hospital in order to be safe. The midwife then mentioned that April Kermani was affiliated with them. I had seen April before when she was working at an OB/Gyn’s office in town, and I remember feeling very comfortable with her. I had not realized she was now doing home births. I scheduled an appointment with April, and my husband and I felt right at ease. She sent us home with the DVD “The Business of Being Born.” Watching the documentary revealed how much control women relinquish when stepping into a hospital to deliver, from routine pitocin inductions to the woman’s position (on her back) during labor and delivery. Seeing the beauty and intimacy of a home birth juxtaposed against the standard hospital birth piqued my interest. 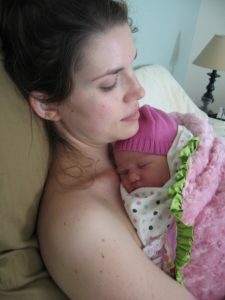 I decided to do more research and became much more comfortable with the idea of a home birth. My husband was so supportive of my research and so trusting in my body’s ability to do what it was created to do. Each visit with April and her student midwife, Allyson, left John and I more reassured that this was the right choice for us. Hands were an essential element of my pregnancy, labor, and birth. While I was pregnant, my husband, John, would pat my baby bump to say hello to our growing baby girl, Lydia. As my baby grew and progressed, I would rub my belly, reassuring my growing baby that I loved her and that even though I had no idea what I was doing, I would do my best to convey that love to her in the way she needed it most. Family members and friends would place their hands on my ever-expanding belly for a chance to feel Lydia’s kicks and swivels and pirouettes. Some new to the pregnancy story would draw their hands back, startled when they felt her movements. Others would press more firmly to feel her presence. I remember on one occasion being surrounded by girlfriends who each had a hand on a different part of my belly—wondering if their hand was in the lucky spot to feel a kick. At each visit my midwives would carefully measure and palpate my belly to ensure proper growth and inform me of Lydia’s location. Before placing their hands on my bump, they would always rub their hands together—my petite midwives were victims of the temperature in the office, made cooler for the overheated pregnant mommas. An ultrasound, performed by our friend Chelsea, provided a due date of December 26. I felt so bad, not wanting Lydia to feel “gypped” having her birthday so close to Christmas. I consoled myself with the silver lining of after-Christmas shopping. I also guessed I would be late, as my mom had been with all five of her children. I then decided to aim for a New Year’s baby. I thought a birthday of 1/1/11 would be cool. As the days progressed, and New Year’s Day came and went, friends joked that I could just go for Plan B: 1/11/11. I thought that certainly I wouldn’t still be pregnant by then. January 9, 2011, I woke up with slight cramping in my lower back—similar to menstrual cramps that were a far distant memory. The sensation felt promising, so I texted John (who had gone to church for early meetings) and my doula, Marcie, to let them know. John and I spent the day walking around the neighborhood, kicking a soccer ball, and trying to remain active—it was still early labor. At exactly 42 weeks, we took the last of the weekly “belly bump” pictures to document our pregnancy adventure. That night the birth tub was assembled and my doula arrived and had me walk up and down stairs and bounce on an exercise ball. I was shocked that a laboring woman would have to move so much! When I became tired, I lay in bed, trying to sleep between contractions, which was not very successful. With each new wave, Marcie would press her hands on my lower back to relieve the pressure. She taught John how to hold his hands, and he would take over when she would leave the room to get food and water or warm the hot pads for my back. Marcie stayed with me all night, holding my back when it seemed it would burst. She recommended a hot bath, which eased the contractions and allowed me a bit of sleep. The next morning, John held my hand and waist as we walked outside in freezing weather—to my chagrin. Again, I was dismayed that women in labor would have to move so much! Sadly, I was not progressing much, and Allyson stopped by to monitor Lydia’s heart rate (which was stellar). Because things had slowed, Marcie and Allyson left with promises to return when things picked back up again. I was left to stay in John’s loving hands. My dad was in town on business, staying at our house. Even though I was two weeks overdue, I don’t think he had considered that I could go into labor during his visit. 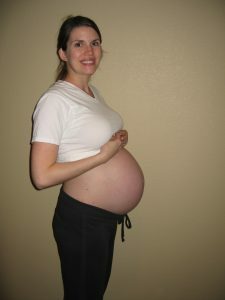 He is a high energy person to begin with, but my being in labor drastically intensified his energy—he was nervous and worried that things were taking so long. Fortunately, he did not raise these concerns to me, but rather to my doula, whose easy-going response seemed to make him more nervous. His presence in the house was admittedly overwhelming, but because his schedule was full, he was not home very long. As soon as he left, the energy palpably diminished. My mom flew in that Monday afternoon. She thought that certainly I would have had the baby by then, but it seems Lydia wanted her grandma there to see her grand entrance. When my mom walked into our bedroom, tears welled up in my eyes. I stood from the exercise ball to melt into her arms. There was no one I wanted to see more than my mom—this woman who had brought me and four other children into this world naturally. She too had given birth at home—unplanned—to my older sister; her own mother caught my sister before the midwife could arrive. Her presence reminded me that her strength ran in my blood, that we women were built for this hefty but surmountable task, that the legacy of powerful women would be continued with this birth. 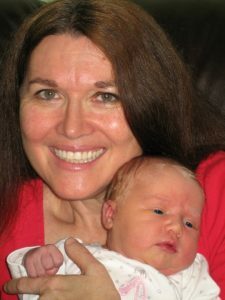 As more waves of contractions came, my mother’s gentle hands gained strength and rubbed the pressure out of my low back. John’s fingers found mine and supported me through each new surge. My mom was keenly (almost obsessively) watching the clock to time each contraction. While she scribbled the times on a yellow notepad, John gave me counterpressure just above my hips as Marcie had taught him. Marcie arrived that evening around 5:15. She took over the counterpressure while my mother kneaded my low back and John stroked my hair. My midwife April arrived that night to check on things and offer encouragement. When I asked when they thought Lydia would arrive, Marcie and April guessed times—admittedly unsure—but settled on “She will be born before the sun rises.” Again at Marcie’s suggestion, I took a bath that night to help my body rest. At some point, I took a shower to ease the contractions and cleanse myself from the hours of effort put forth so far. Marcie had stayed up with me all night again. The next morning April arrived, worried that she had for the first time slept through a phone call saying I had delivered—of course she hadn’t. It seemed the labor was interminable. I had no sense of time during labor, so the fact that I was entering day three of labor was lost on me. At this point, April asked if I wanted to be checked to see how things were progressing. I agreed, and she let me know I was at 4 cm and 80% effaced. She said it takes the longest time to get to that point, and labor should progress more quickly. She felt Lydia’s head and found that she was indeed in the correct position. (We later supposed that she had been posterior for the first while, which is why labor taken so long. Apparently those polar bear twists really do work to flip the baby!) I was overjoyed! I had never known such hope. When I was indeed in active labor, I was finally allowed into the water tub. What relief! Still, Marcie or John provided almost constant counterpressure as each wave of tension crashed into the next. John gingerly placed a cool wash cloth on my forehead and neck. My mother helped me sip a fruit smoothie she had made. At my request of “Bowl!” someone would throw a metal bowl under my face so I could vomit. (I think I may have been hit in the face with a hastily placed bowl once; for days after the birth, my chin ached as if it were bruised.) Once when I called “Bowl,” John responded, “I’m on it,” but no bowl appeared. I looked up and pleaded frantically, “Bowl!” again, and he scrambled up from the ball (which he thought I had said) and got the bowl to me just in time. I ended up just keeping my head in the bowl, which Marcie had rubbed with a citrus scent to alleviate my nausea. It helped me block out the rest of the world and focus on getting through each surge. April returned that afternoon and changed from her professional attire into grubby clothes (a good sign!). While I was zoning out in the tub, Allyson arrived wearing a pink hat. My glasses were off, and instead of hello, I greeted her blurry image with, “You dyed your hair pink!” I overheard Marcie tell April, “She’s not acting transition-y, but I know she’s in transition.” That bolstered my confidence, but I had to get out of the birth tub so the water could be changed out. (It had been sitting since Sunday night.) At one point, I was hugging (and hanging onto) John, feeling so much gratitude and love for those in the room. I couldn’t help but kiss John and tell him I love him. I was on an oxytocin high. There was no “you did this to me” screaming—merely gentle words of love expressed. I was bouncing on the birth ball while April provided counterpressure and chatted with my mom about my spine sticking out. (Apparently, during labor the baby pushes the spine out of the way!) With each surge, I had to stand. April said, “I’m noticing that you’re standing. Why is that?” I replied, “Well, I feel like I have to poo!” She asked if she could check me again, and I consented. I was shocked when she said, “Why don’t you try giving a few pushes—you’re at 9 and a half cm.” At that point I felt a warm trickle—I thought it was my water breaking, but it was only a forebag; my water was still intact. I remember April telling me that I had demonstrated not simply an act of strength, but strength of character in doing what I knew to be best for my baby. That was one of the greatest compliments I had ever received. My mother returned to the room. John held one leg while my mom held the other as I pushed for the first time. It was so surreal. Allyson and Marcie re-entered the room, and the birth tub was quickly filled with fresh hot water. I was so relieved to return to the soothing tub. At this point, I remember more acts performed by each pair of hands—April brushing my hair back into a ponytail, Allyson applying chapstick to my lips saying, “This is so you look pretty for the pictures.” (She had remembered from a previous appointment my saying that I only felt pretty when I wore lip gloss.) John got into the tub and supported me from behind. With each contraction, he would lift my body slightly. I remember April suddenly having a commanding tone telling me how to push and when. The power in her voice brought me such reassurance. Once I finished a push, she told me to take a big breath and push again. I remember being willing to do whatever she told me to do. (It is true—women in labor are very compliant.) She asked for three pushes, but I would give four because the contraction was still lasting (and four is my favorite number). I remember my section of cheerleaders—my mom telling me, “Push, push, push” (I remembered thinking, “What else would I be doing?”), my midwives and doula saying, “Good job, momma,” “She’s getting closer with each push,” “Such a powerful momma” (that one was my favorite). I had no idea how I was going to get Lydia’s head out of me, but I kept listening to the coaching and cheering to guide me. Finally, my water broke just as Lydia’s head shot through—the sensation was incredible. I asked if I could touch her head—“Of course!” was the response. I reached down between my legs and felt her head—it was so soft and so tiny! Finally, with one last surge, the rest of her body slid out into the warmth of the water tub at 5:15 p.m. on January 11, 2011. (Apparently, Lydia liked 1/11/11 more than 1/1/11.) April said, “You can pick up your baby, momma.” In awe, my hands reached into the water and lifted the most beautiful, precious, and robust baby to my chest. My hands were the first that lifted my baby into this world. Everything about her was perfect. The first thing I noticed were her big, beautiful lips (her momma’s!) and then how big her feet were (for a newborn at least). The birth was exquisite—more than I could have imagined. After all my efforts, no one whisked my healthy baby away. Rather, I could sit peacefully in the tub, supported by my husband, holding this precious new person. Lydia could hold her head up the moment I placed her on my shoulder and she stared deeply into her daddy’s handsome face. My dad arrived back home shortly after Lydia was born. He had not seen my mom’s text alerting him to Lydia’s arrival. My mom met him in the hallway and asked him if he wanted to meet the baby. He was stunned. I remember his face broadcasting his amazement as he entered the room. He said, “This is sacred! This is how every baby should be born!” He asked how much she weighed, but we did not know yet since Lydia was still connected to the umbilical cord. She was able to stay connected to the cord until it stopped pulsating, which enabled her to get her oxygen-rich blood back into her system. With April’s guidance John gingerly cut the cord, and I delivered the placenta with one final surge. April showed me the placenta (which showed no signs of calcification, meaning Lydia’s “life support” was functioning beautifully even though she was 16 days late) and warned me to rest because I had a “wound the size of a dinner plate” in me. The visual aid was very compelling, and I heeded her words. I handed Lydia over to be weighed and measured—8 pounds, 14 ounces, and 21 and a half cm long—and I was gingerly helped out of the tub. I thought I had torn, but April and Allyson reassured me that “everyone thinks that.” Upon closer examination, I had only an abrasion on one side and a tiny notch in the center that did not require any stitches. I couldn’t believe my luck! Lydia received her first bath, and my mom dressed Lydia in her first diaper. 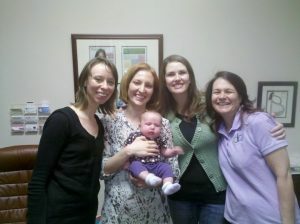 As John showered, my wonderful birth team guided me in nursing Lydia. I felt so excited that this feat had been accomplished, so empowered, but also so very hungry! Fortunately, my dad had bought a huge box full of food from a Chinese restaurant down the street—enough to feed the birth team, who must have been famished, my family, and John’s parents who had come over to meet Lydia. There was so much love in our home that night. Three days of exhausting work, and I received the grandest prize—my beautiful baby girl. Gazing at her tiny, perfect face, I saw that little Lydia was indeed “trailing clouds of glory.” John and I, curled around our new baby girl, never knew greater happiness than that night. I could not have done it without my amazing husband and those powerful women surrounding me. During labor and birth, I remembered being so grateful for the women guiding me through—my mom, with her loving and serving hands; Marcie, with her strong and healing hands; April, with her capable and guiding hands; and Allyson, with her caring and compassionate hands. What a powerful experience to guide my daughter into this world with my hands, shaky but full of love, after being guided through labor and birth by others’ loving hands.